Sand, Cider and Spaceships: BB77 - I'm Not Dead, I'm Not Dead! 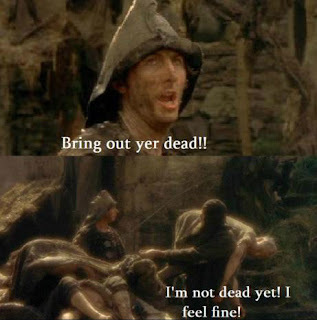 BB77 - I'm Not Dead, I'm Not Dead! One of the problems with being in charge of the Blog Banters these days is that my own view on the topic doesn't get posted immediately. I ensure the main blog banter posts stands on its own for a few days before I reply. That bloody Neville has stolen a lot of what I wanted to say, and it's not just me saying that! The Blog Banter monthly question does not represent Drackarn's or any of his affiliates views and is solely for entertainment purposes. When Angry Onions and Easy Esky (not me, these two!) suggested "The Malaise" / "Decline due to Colonists vs Immigrants" I added it to the list of possible topics I send around the "Itteh Bitteh Blog Banter Committeh". A couple of high-profile bloggers who I send a list of topics to and they reply what they think would make a good topic that month. For this month one said this would be a good topic and the other said "Don't ask me, I'm at this weird crossroads, not blogging and not sure if I'm coming back." Yes, I am feeling the malaise. I don't think Eve is dying, but it's changing. Personally I'm just not into Eve currently. Haven't been this year. Fanfest was one of the reasons. 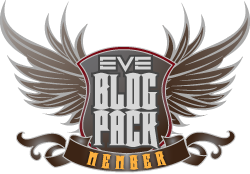 Usually it reinvigorates me and I'm much more into Eve when returning from Iceland. This year I wasn't, in fact it was the opposite. As far as Eve development goes there is nothing really interesting for me (again this is a personal thing) on the horizon. Structures are nice to look at but don't feature in my play style. Events, PVE and the like, are the same. What really depressed me from Fanfest was the Low-Sec/PVP/Crimewatch roundtable. It was almost an exact repeat of 2015 only this time Fozzie wasn't saying they might have some dev time later in the year (which obviously never materialised), he just nodded and smiled. Anyway that's my "Malaise" with Eve. Crap timezone, empty low-sec and nothing to look forward to. Yeah.... Nothing for me to look forward to this year other than may be more even 1v1's in Tama as boosts are likely to go AoE. We look further into the future and we hear about the "new space". I don't want new space! It's already too spread out as it is (in my TZ)! A good example of how Eve is changing is when I logged on at the weekend and there in the UI is a section encouraging me to go out and mine 50,000 cubic metres of Veldspar. NOPE! This rang a bell with Angry Onions' "Colonists vs Immigrants". Daily quests? Skill injectors? NPC's telling you to go mining? Instant gratification being the way to go is it? This combined with what I enjoy doing in game (low-sec PvP) has nothing planned so nothing to look forward to reminds me of a scene from The Holy Grail. Yeah, Eve is not dying (we might be at 2006 peak user levels but that's still 30-40k), but from my own gameplay perspective its not healthy. TBH, just go read Neville's response. I admit, I don't quite understand this perspective. I always felt that the unique element of Eve wasn't "what CCP provides us", but rather "what we do with what CCP provides us". I honestly haven't seen my Eve change dramatically as a result of iterative releases. If I want to solo, the ships may change, but the tactics are pretty much the same, or become more diverse (eg. jump-fielding fleets to separate them). If I want to fly a cancer ship, in 2009 it'd be the Dramiel or Cynabal, in 2011 the Drake or Ishtar, in 2016 the Svipul or Orthrus. But, the underlying principles are the same. Is industry, market trading, mining, etc. any different? Okay, so the interface changes for industry. Pieces of it have become easier (I'm looking at you multibuy, multifit...), other pieces have become more difficult. But has the essence really changed that much? I tend not to get very worked up about releases, I suppose. So, now I dock at citadels instead of stations. I need to put a little more thought into market trading. But the essential gameplay is the same. To me, the releases have been more "Look, the backs of the cards in the deck are different!" than they've been "We're playing Pinochle instead of Poker". I have to agree with Talvorian here. The game may have changes here and there, but its still the same game, as long as you adapt with the changes. And CCP has mostly ignored them. Also, PvE is not a tool to "do something with it". It's passive consumption thing. PvE doesn't allows to "do things with it". Anyone who "wants to do things" is forced to jump through a series of PvP loops... PvP loops owned by people who's been doing it for 10 years or more. So Pve fidn thmselves as.. There is no sandbox for the PvE players. There is not even sand nor a box. They're inmigrants to second class citizenship. As most new players will become PvErs... some little will fill the ranks of the former colonists who made the game 10 years ago... and a few more will be crushed while failing to become colonists themselves. Yes, I accept responsibility for this topic. My prospective is that it is not the fault of the game, but within myself. Goals were set and goals were achieved. I play it SMART. I just do not have a goal now - thus not feeling enthusiastic about Eve anymore. IRT Talvorian. There have been a lot of changes in Industry over the years. Industrialists are largely quiet about it because so few of them are connected into the meta game to discuss the changes. So they either adapted (as I have) or quit the game or play style.